Once again, Rick & Ann’s has invited Eating Saigon! to present a fun and delicious Vietnamese dinner at their Berkeley restaurant. Wine is available as well. If you wish to bring your own wine, there will be a #25 corkage fee. Rick and Ann’s is proud to present Vietnamese chef Hai for an evening of Eating Saigon. Many years ago, Hai took over the 60-year-old restaurant, Dong How Xuan that his grandmother started in Vietnam. 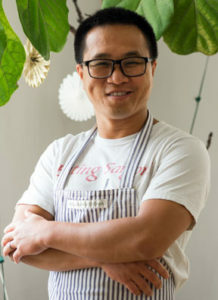 Since moving to the Bay Area, Hai and his partner Joe started a popular food blog called EatingSaigon.com. He is offering some of his favorite Vietnamese dishes on this evening out. Please come join us for a fun and delicious night out! A credit card is required to hold your reservation. Seating #1 at 5:30 p.m. Seating #2 at 7:30 p.m. Call Rick and Ann’s at 510-649-8538 for Reservations.